Launched in March 2010 as a part of the Nationwide Health Information Network (“NwHIN”), the Direct Project was created to specify a simple, secure, scalable, and standards-based way for participants to send authenticated, encrypted health information directly to known, trusted recipients over the Internet, enabling interoperable, secure messaging in the healthcare industry (“Industry”). Those Direct Project specifications and protocols are now known as the Direct standard, which meets a federal requirement for Meaningful Use Stage 2 as laid out by ONC and CMS in promulgated regulations and rules. “Directed exchange” is the term used for this secure communication. For health care professionals, patients, and others to take advantage of Directed exchange of health information, Health Information Service Providers (HISPs), must coordinate the roles of Certificate Authorities (CAs), and Registration Authorities (RAs), while carrying out the responsibility for managing the intricate parts of the deployment of digital certificates and of managing public and private keys, which are necessary for Directed exchange subscribers to be assured of consistent privacy, security, and trust. Together, HISPs, CAs, and RAs are known as Trust Agents for the deployment and adoption of Directed exchange. Facilitates security, interoperability and trust among Direct exchange participants; fosters public confidence; and otherwise promotes the adoption and success of Directed exchange through the promotion of policies and best practices for security and trust, consistent with state and federal law, for the purpose of improving the quality of health care through secure electronic exchange of health information. DirectTrust has developed and is continuing to develop specific standards and policies for Directed exchange Trust Agents, which enjoy widespread recognition in the Directed exchange community. HISP: A Health Information Service Provider (HISP) is an organization that provides services on the Internet to facilitate use of Direct. A HISP is a logical concept that encompasses certain services that are required for Direct-mediated exchange, such as the management of trust between senders and receivers. It may be a separate business or technical entity from the sender or receiver, depending on the deployment option chosen by the implementation. A HISP maintains the digital certificate on the user’s behalf. Using this digital certificate, the HISP can securely send or receive Direct messages for the entity. The user initiates outgoing messages, and accesses incoming messages, through facilities provided by the HISP (often through a secure e-mail portal or client). This program is offered through DirectTrust and must be successfully completed along with the EHNAC HISP P&S Accreditation program**. EHNAC HISP Privacy & Security (P&S): This program accredits the HISP for HIPAA Privacy and Security which is a requirement when an Organization is accredited for the HISP specific requirements by Direct Trust. Please also see HISP above. The Direct Trust HISP program is a new initiative by Direct Trust in 2018 for all member HISPs**. 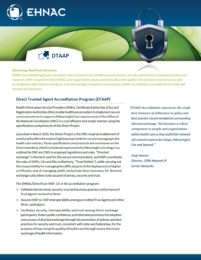 DTAAP RA: An entity whose primary function is to reliably authenticate identities of individuals, organizations, representatives of organizations and their services, and administrators of services and devices. They are responsible for identification and authentication of certificate subjects. RAs evaluate and either approve or reject subscriber certificate management transactions (including certificate requests, renewal and re-key requests, and revocation requests). * HISPs must apply for and become accredited through DirectTrust’s HISP program and the EHNAC HISP P&S Program. HISPs that provide their own CA and/or RA services must also apply for and become accredited for DTAAP-CA and DTAAP-RA in addition to HISP. If a HISP does not provide either of these services, they only need to apply for HISP (through Direct Trust) and HISP P&S (through EHNAC) but show evidence that they are using only EHNAC accredited CAs and RAs for their HISP services. * CAs must apply for and become accredited through the DTAAP-CA program. * RAs must apply for and become accredited through the DTAAP-RA program. To begin the application process for the Direct Trusted Agent Accreditation Program (DTAAP) for CA and RA, or the EHNAC HISP P&S accreditation please complete the application form through our website. Program criteria are located on the criteria page. Please contact DirectTrust for information on the HISP program specific Accreditation Program. **DirectTrust HISP will also support an appropriately-scoped HITRUST Security and Privacy Assessment with certification. EHNAC is a certified HITRUST Assessor and can conduct this assessment. Also, are you looking for hands-on support to help you through the pre-assessment steps, readiness planning process and more? Learn about EHNAC’s Consulting and Advisory Services which have been designed to support the Direct Trusted Agent Accreditation Programs.